For the filling, mix the pork with the herbs, spices, breadcrumbs, salt and pepper. Break off a little nugget and fry it so you can make a call on the seasoning. More herbs could be added or perhaps more cayenne if you like it hot. To make the pastry, combine the butter cubes in a bowl with the flour and salt, then add just enough water to bring together into a fairly firm dough. On a well- floured surface, roll out the dough in one direction, away from you, to a rectangle about 1cm thick. Fold the two short ends into the middle so they overlap. Give the pastry a quarter-turn, and repeat the rolling and folding process five more times. Wrap the pastry in cling film, then rest it in the fridge for 30 minutes–1 hour. Roll out the pastry on a floured surface to an oblong, about 45 x 12cm and 4mm thick. Lay the sausagemeat along one long side of the pastry, about 3cm in from the edge. Brush this pastry edge with a little egg wash and fold the other side of the pastry over the top of the filling to enclose it. Crimp the edges together well to seal. Lightly brush the pastry with a little of the egg wash, then scatter over the fennel seeds and a light sprinkling of flaky salt. Place the sausage roll in the fridge for 10 minutes or so to firm up. Meanwhile, preheat the oven to 180°C/Gas mark 4. 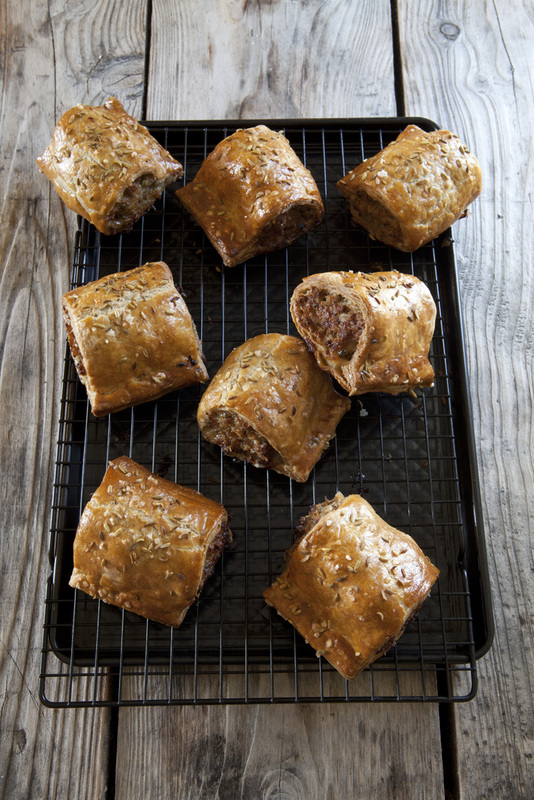 Using a serrated knife, cut the sausage roll into 8 lengths and place on a baking tray lined with baking parchment. Bake in the oven for 35–45 minutes, until golden brown. Remove the sausage rolls from the tray to a wire rack to cool. Eat warm or leave to cool before serving. They can be kept in the fridge for a day or two.